A crucial part of a product's success is how you build the brand that surrounds it. You can have an awesome product all day long, but if nobody knows about it, they can't buy it or tell anyone about it! Why are you better than your competitors? Why should a consumer spend their hard earned money on what you're selling? How is this product going to make their life better? These are all questions that a company's marketing team has to answer in a way that isn't overwhelming, pushy or worst of all... BORING. There are so many ways to advertise and promote a brand in the 21st century. Consumers can research and compare products from anywhere in the world at the touch of a button... literally. A key part to marketing is knowing WHO your customer is and WHERE they spend their time. These days, people are flooded with information and to say it is tough to make yourself stand out is an understatement! 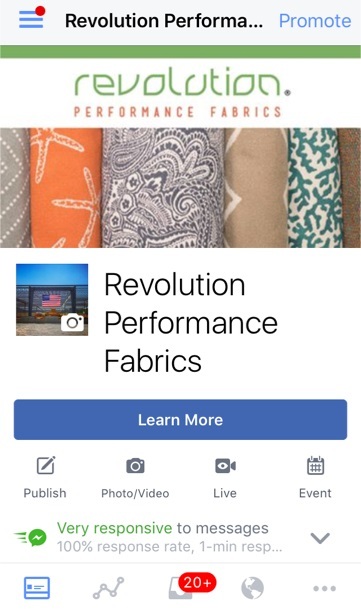 Revolution Performance Fabrics hit the marketplace three years ago and the response was unbelievable and continues to grow at a rapid pace! One of the many reasons Revolution has seen so much success, is the branding and story behind the product. Anderson Gibbons and Jill Harrill are the two man (woman) marketing team behind Revolution and are going to share some inside scoop on how they build the Revolution brand every day. What inspired you to start an education and/or career in marketing? And what has your marketing experience been thus far? J: I have a sister that is four years older than me and I have always really looked up to her. She graduated with a degree in Mass Communications from the University of Georgia and would tell me about all the cool marketing projects she was working on... and of course, all the fun SEC football games she was going to! She encouraged me to go to the University of South Carolina, where I graduated in 2009 with a Bachelor's degree in Marketing & Public Relations. After graduating, I moved to Charlotte, NC and worked on a marketing team for almost six years at a large international construction firm. I had the opportunity to work on projects for customers like NASCAR, Bank of America, Facebook and Google. It was a very "corporate" side of marketing, but I learned a ton and was fortunate to have some amazing mentors that taught me how to handle tough business situations. I started at STI in February 2017 and it has been an awesome experience and a huge breath of fresh air! A: Honestly, I went to college at Montana State University not knowing what I wanted to study. All I knew was that I wanted to ski, hunt and fish. After realizing that you don't need a degree to ski (duh...), I quickly switched my degree from Snow Science to Business. Marketing was a natural fit for me and my personality. I became obsessed with the field. I took extra classes and even started my own company my senior year; the company was called Finding Bluebird Days. I took a 1980 Bluebird bus and converted it into a mobile cabin that traveled around Montana. The bus company took off quickly and I actually dropped all of my classes except one my senior year. It became a huge hit around Bozeman for parties and trips. The bus was booked every weekend in the Summer. It was fun, but it was a lot of work. I ran the company for a year and a half before selling it to a buddy... I was ready for something new. I learned everything I know from starting Bluebird Days. I learned about an elevator pitch and sales because I had to pitch the Dean of Business Students on why I couldn't learn the skills I needed in her classes and how I would be successful in my 60 credit independent study. I learned accounting, finance, social media and marketing. Most of all, I started learning about how to start a business and how to manage my personal time and employees. Kids today do not learn this in school. I fell into my current position at STI because they were about to launch Revolution Performance Fabrics. Sean and the rest of the team needed a website and marketing materials. STI was about to outsource everything to a digital marketing company. I was living in my truck at the time and submitted a quote for the website way below the digital marketing company… my bid was a $100. I was hired the next day. What is a day in the life of the Revolution Marketing team? J: Every single day is different! And I think that's what keeps us on our toes. We do so many different things... managing our online store, working with our furniture manufacturers to create innovative sales materials, sharing content on our social media pages, creating ads for industry magazines... the list goes on. Managing our social media pages and sharing fun news about our company, employees and customers is probably my favorite thing to do. A: As Jill said, every day is different on the Revolution marketing team. We have to wear multiple hats. The day usually starts with customer service for the online store and moves quickly to designing new POP materials and videos. We usually add products to the web store around lunch and the afternoon is spent exploring and brainstorming new marketing opportunities. Once we leave King's Mountain, our day does not end. Our nights are filled with answering online customer service inquiries and communicating with social media influencers. The Revolution online store, revolutionfabricbytheyard.com, started in January 2017. What has the response been? J: CRAZY! But, good crazy. The e-commerce world is highly competitive and it takes a lot of strategic thinking and even more hustle to be successful. We've had to do some trial and error to see what works, but we are really hitting our stride. I'm really proud of what we've done and can't wait to see what the future holds. It has taken a whole village to get the online store going so the marketing team definitely can't take all the credit! A: The response to the online store has been very positive. It is really the next step in promoting the Revolution brand to the high end and interior designer markets. The store allows us to have a direct relationship with the customers who buy from our primary customers - the furniture manufacturers. It really cuts down on the game of telephone, "the he said, she said." It's great to get insight into what the end consumer looks for in their fabric and furniture choices. All of this information can translate back to making a better experience for our furniture manufacturing customers. What are some of the ways Revolution differentiates themselves from a marketing standpoint? J: Well, Revolution is a different story to begin with so it's really just getting that story out there to a relevant audience in an impactful way. I think we really capture people's attention by being PFC free and 100% made in the USA. I also think customers can tell that we genuinely care and want them to be satisfied with our product. With the online store, it never seizes to amaze me how many people are truly shocked when a real person calls them or directly emails them with an inquiry response... they are so used to an automated service or sitting on hold for 20 minutes or forever. I'd say that our people, product and story is what sets us apart. A: What I can add that hasn't been said yet... Jill and I take the marketing and customer service very personal. I think we both truly love what we do and we love to help people out. I truly want to provide a performance fabric for everyone who wants and needs one... A performance fabric without PFCs, that is made in the USA and doesn't cost a fortune. I'm excited for the marketing team and to be a part of the next generation of STI. Revolution Online Store: RevolutionFabricByTheYard.com has over 200+ Revolution and Revolution Plus SKU's. Customers can purchase swatches for $2 with free shipping and of course, yardage! We are excited to share that we now are selling Phoenix Trimworks trims and tapes on the site as well! *POP provide all the important information about Revolution: PFC Free, 100% Made in the USA, Easy to Clean, Stain Resistant for Life, Smallest Carbon Footprint, Resists Fading in Sunlight. *Oftentimes, we will customize POP materials with our customer's logo on it as well. 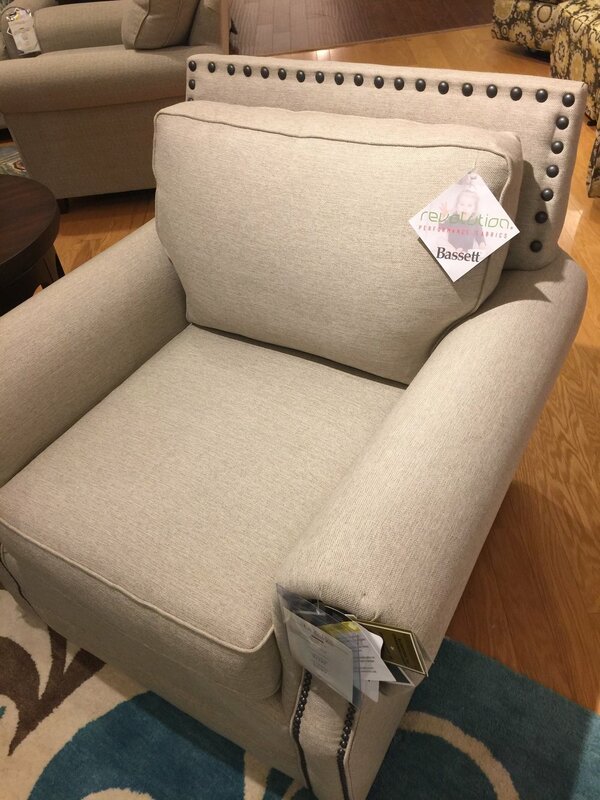 See above Bassett Furniture and Revolution hang tag. 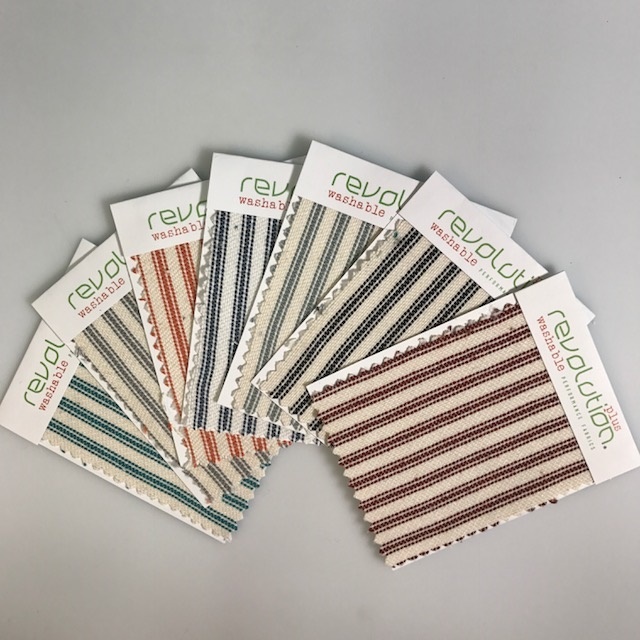 Revolution POP Materials: Providing our customers with Revolution point-of-purchase materials is crucial to raising Revolution brand awareness. Many of our POP materials include detailed cleaning instructions and information about why our product is different... and of course, LILY! *The Revolution truck making its rounds at High Point market! Revolution Advertising: Colorful photos, bold headlines and quick, direct information are important factors to having a successful ad. Revolution ads can often be seen in Furniture Today and Showtime Magazine. *Two Revolution pillows being sent to an Instagram give away winner! Revolution Social Media: Social media is a HUGE sales and marketing tool. It is a powerful platform that reaches an infinite customer base for a minimal amount of dollars. We heighten our following and engagement by doing fun give-aways on Instagram (such as Revolution pillows, totes, etc) and partnering with industry bloggers and influencers to talk about Revolution. Follow us on Instagram, Facebook and of course, the Revolution blog!